Kevin K., Kevin M., and I went round the Wildlife Drive on the Lake Apopka North Shore yesterday. This 11 mile long section of dirt roads opened to the public earlier this year and provides access to a large part of the restoration area near the lake. 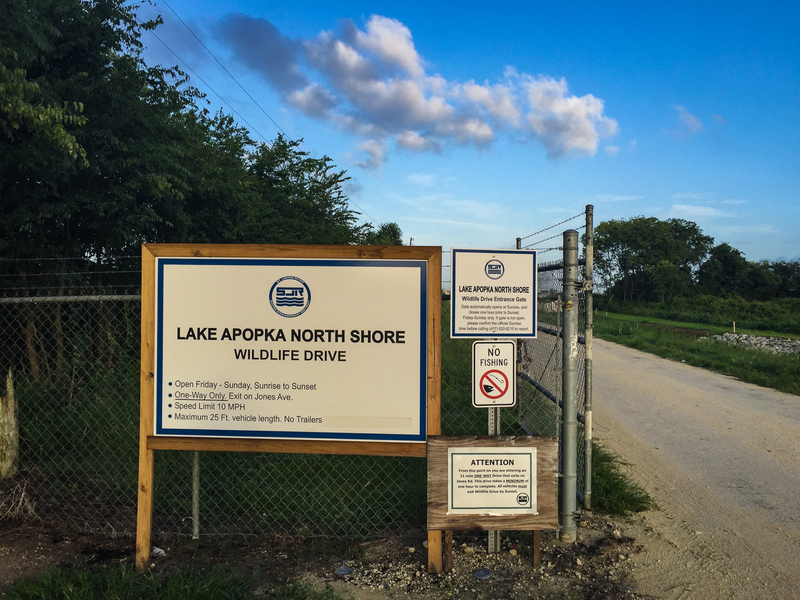 Lake Apopka Wildlife Drive Entrance. This was mostly a scouting trip as Kevin K. and I had never been, and since it’s the middle of the summer we didn’t expect to see a lot of wildlife. But similar to Viera Wetlands, there was lot going on. We saw many of the usual Florida birds and even some unusual ones like Least Bitterns. About half way through, we stopped behind another car observing a tree full of birds that turned out to be swallows. My experience with swallows is that they’re very erratic flyers and seldom sit still – which makes them hard to photograph or even identify. But these were happily perched in the tree and later on power lines. This allowed us to get some good photos and recognize several species. Two (Bank Swallow and Barn Swallow) were lifers for me. I even got both of them in the same frame – how cool is that?!! There was a reported sighting of a Northern Rough-winged Swallow at this same place shortly before we got there, but we didn’t see it. We did see a Purple Martin, which was also cool, although not a life bird. Lake Apopka was polluted for many years but it seems like the restoration efforts are paying off. This osprey for example, looks like it’s living large. The wildlife drive doesn’t open until sunrise, so we got there too late for a morning landscape, but we did stop by Lake Monroe in Sanford on the way. Here’s one image I made there. Judging by this trip, I’ll be returning often, especially after it cools off and migration starts. For more info on this place, visit Scott Simmons’ post on his blog. You can see Kevin Ms photos in this album on Flickr, and Kevin K’s in this album. I only have a couple in my album so far, but I’ll be adding more. Lake Apopka North Shore Restoration Area: another great Central Florida Photo Op! Go! See! Enjoy! Ed, I appreciate a good turn of phrase as much as a good photo. When you said the osprey was “living large”…it really did make me chuckle! Keep it up (photography AND prose)!